29/04: Who needs SEO services? If you own a personal website and do not need the attention, your search engine ranking will gradually increase over a period of time--assuming your content is unique and updating frequently. This might take a few years to decades. However, if you need visitors and generate sales to your web site, Search Engine Marketing is the answer. SEO (Search Engine Optimization) will generate targeted traffic increases with great returns on investment. SEO earns substantially better ROI than PPC Ad Word services. Over 75% of your search engine visibility depends on SEO with approx 70% of clicks from search engines coming from the organic or natural listings. SEO (Search Engine Optimization) is the most cost effective marketing tool for accquiring new customers and traffic. SEO is worth committing to professionally for your web site. SEO comprises of a multi billion dollar industry growing at a rate faster than any other marketing channel due to the large ROI SEO generates. Google, MSN Search and Yahoo. If not, you are in need of SEO to increase your search engine rankings. Successful SEO promotion services require extensive preparation, experience, talent, labor, and time. SEO campaigns require researching the best phrases/keywords to use and using SEO applications to apply the research on your web pages. Search engines gain the trust of users and traffic by providing objective relevant information. This is why SEO (Search Engine Optimization) is so important: Your web site appearing on the first page of search results for a particular search phrase will attract targeted potential leads to your site. Once a visitor has reached your site from the search engines, it is now up to your web site to complete the process and provide something for that visitor. Increase your search engine traffic and rankings. 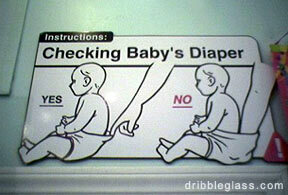 Hey, just a little heads up if you ever need to change a diaper. I stumbled upon a very interesting and unique website. The following cartoon is one of the examples of radical art collection on the site. 21/04: Top 10 outdoor store signs... check em out. 20/04: Basics of MP3 digital audio... its important stuff! Got some lil pieces of info to enhance your MP3 knowledge. Learn it well and you won't be stumped when someone asks "Yo buddy, what's the bit rate all about anyways?" What's the deal about bit rate? A term widely used in audio compression is bit rate. It is the average number of bits that one second of audio data will consume. The unit used is kbps (1000bits/second). Hey everyone. I finally got mohammadi.ca as my domain. Some idiot registered mohammadi.com a couple of years ago and will not let it go. He is offering $890 USD to change ownership. He still thinks he can sell domain names for that much! Haha. I am not sure what the demand is for mohammadi.com but he's holding on strong. He has also increased the price by $30 USD since last year. So let's hope it works out for him. Anyways, this is the place where I'll be posting pictures, jokes, etc. from time to time. If you have any questions or comments, please send them my way. Hopefully, I'll put some games on here as well. But it will be mainly for pictures of events and other personal stuff. Cheers and hope you enjoy the site.